Female German shepherd is obsessed with male cat. German shepherds are intelligent, loyal pooches with strong natural herding instinct and prey drive. These traits can make them somewhat undesirable as a companion to a kitty, whom they might view as worth chasing. But harmony can prevail, particularly if you adopt the shepherd as a puppy and socialize him properly. Before adopting a German shepherd puppy, ask the breeder or shelter behaviorist if the pup was raised around cats prior to adoption. He'll be more likely to get along with your kitty if he was. German shepherds are high-energy companions that need lots of exercise to prevent behavioral issues. Provide your little pup with brisk exercise and play for an hour each day. A well-exercised pup will have less desire or energy to chase your kitty around the house. German shepherds naturally have a high prey drive and could seriously injure a kitty by viewing her as something to hunt, even as puppies, only in part because of their large size. If you are having issues with your shepherd and your kitty, even after slow introductions, consult with a certified animal behaviorist. German shepherd puppies don't respond well to negative training methods or punishment. Negative reinforcement can instill aggressive behavior, making them potentially dangerous to people and other pets. 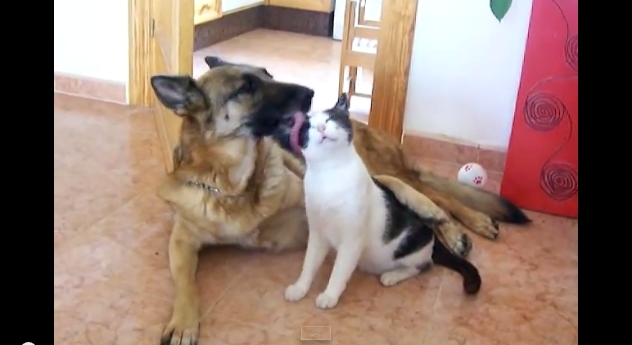 Responses to "Daily Cute: German Shepherd and Cat are in Love (Video)"